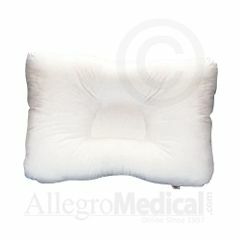 The D-Core Pillow gives proper cervical support at an economical price. This orthopedic fiber pillow’s patented D-shaped center gently supports the head and neck during sleep to help remedy many common ailments, including tension headaches, neck spasms, arthritis and snoring. It complements active treatment in the Correct stage of the TriCare Circle of Health. And once in the Maintain stage, and helps ensure continued good health by sustaining the proper curve of your neck and spine. Suitable for both back and side sleepers, the D-Core is filled with cool and comfortable, non-allergenic Corefill® 100% polyester fiber. Full size and midsize versions make it easy to choose the size that is right for you. would recommend. used for self every night. The pillow does help. Solid , helps me sleep. sleeps longer. would recommend. used for self every night. The pillow does help. helped end snoring. I purchased the pillow for my husband. He kept me up at night snoring. We both sleep like a baby now. We are very happy with his new pillow. Comfortable. Solid Construction. Easy to Control. I have had neck and shoulder problems for years. I was sleeping on a contour pillow, but was still having neck and shoulder problems. Since sleeping on this pillow my neck does not hurt and my shoulders are no longer sore. I sleep like a baby! It is very comfortable and when I first received the pillow I laid on my back and felt my whole body seem to relax. It is different, but you get used to it right away. To me, it is heaven. used for self every night. Very Comfortable. I sleep great. Comfortable. Solid Construction. Easy to Control. Attractive Design. Multiple Positions. It is Firm. Good Cushioning. Help my c-spine. Help my c-spine. would recommend. when in pain nothing help. sometime we just need med. would recommend. used for self every night. have arthroritis in neck. alot of stiffness. muscle spasm. The pillow does help. The pillow does help. help ease my pain.